"Our community has a crisis-level need for emergency care and critical care beds. We are 'raising the roof' today so we can meet that need," Keith Altshuler, president and chief administrative officer said. 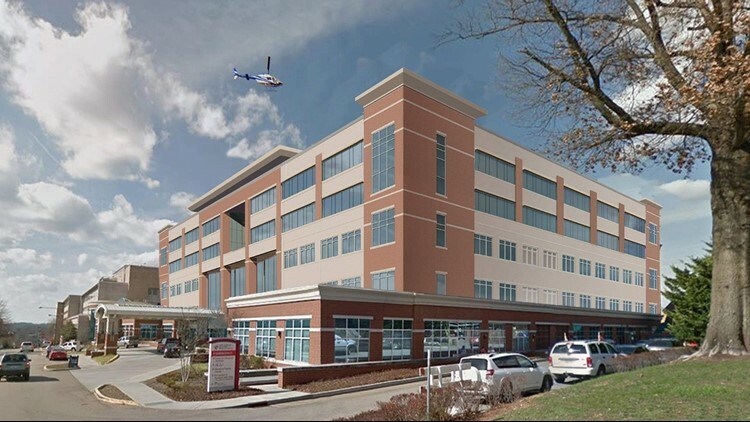 Knoxville, Tenn. — Fort Sanders Regional Medical Center and Covenant Health administrators launched a $115 million building project today that will expand emergency and critical care capacity at the downtown medical center on Clinch Ave. The “Raise the Roof” celebration was held at the hospital’s Center for Advanced Medicine adjacent to the main building, and was attended by more than 120 people representing Fort Sanders Regional, Covenant Health, project designers and builders, the City of Knoxville and several community organizations. As a major regional referral center and the only hospital remaining in the downtown area, Fort Sanders Regional Medical Center is facing increasing demands for services, said Keith Altshuler, president and chief administrative officer. “Our community has a crisis-level need for emergency care and critical care beds. We are ‘raising the roof’ today so we can meet that need,” he said. The expansion project will coincide with Fort Sanders Regional’s 100th anniversary celebration, which will begin next year. The project includes a new emergency department on the first floor of the CAM building. Altshuler said the current emergency department was designed to serve about 40,000 patients per year, and already exceeds that number by about 10,000 patients annually. The new emergency department will almost double the existing square footage, and will increase the number of beds from 20 to 45. The new ED also will include a radiology suite, a holding area for behavioral patients, and an updated waiting area. Plans also include enlarging the Laurel Ave. parking garage adjacent to the ED by 250 spaces. A new critical care department will occupy two floors that will be built atop the Center for Advanced Medicine, nearly doubling current critical care capacity to 72 beds. Altshuler said the new critical care patient rooms will be nearly twice the size of current critical care rooms and will have more space for family members to be with their loved ones. Jim VanderSteeg, Covenant Health president and chief executive officer, said the new project is a tribute to the hospital’s visionary leaders in years past as well as a commitment to the future. Knoxville Mayor Madeline Rogero said Fort Sanders Regional Medical Center is the primary healthcare provider for “the heart of Knoxville and the heart of our region.” She said the expansion is a crucial investment that underscores Covenant Health’s commitment to providing access to quality health care. “I can’t emphasize enough how important it is that Fort Sanders is here, the primary health care option for those of us who live and work in the center city,” Mayor Rogero said. “Proximity matters when there’s a medical emergency, and we all feel more comfortable knowing that Fort Sanders is close by.” She noted that Fort Sanders Regional is a major employer and said the expansion project also represents center-city investment and economic opportunity. City Council member Stephanie Welch represents the 1st District, which includes Fort Sanders, the University of Tennessee community and South Knoxville. Welch said her background in public health gives her a special interest in building healthy communities. “This expansion will play a critical role – [access to] healthcare is part of what makes communities healthy,” she said. Welch also emphasized community partnerships, and thanked the organizations and individuals who worked together to facilitate the expansion, including Knox Heritage and representatives from several city and county organizations. Project preparations included moving two historic homes that Welch said will be preserved as structures which contributed to the history of the Fort Sanders neighborhood.